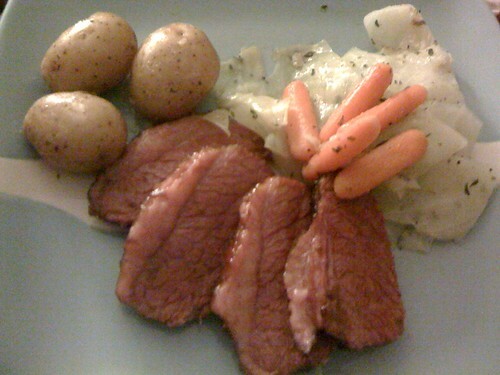 ljcfyi: Corned Beef - Happy St. Patty's Day! Corned Beef - Happy St. Patty's Day! I have always wanted to make corned beef on St. Patrick's Day. Wegmans had handy dandy packages of beef with the spices packed with them so we gave it a try. Pardon the horrible phone pic of my plate. It did take awhile to cook, so by the time we ate it was too dark and I was too hungry to take proper photo. I wasn't disapointed though - it was great!